TGI Playtime, shown by Skip Queen for Carroll’s Cutting,Weatherford, Tex., scored 223 points on Friday, to claim $37,295 for the NCHA Super Stakes Classic win. Creepy Crawler, shown by Luke Huggins for Buster Quirk, and Short N Smooth, with Jason Clark for Darren Blanton, tied with 222.5 points for reserve and each collected $29,266. “Skip set the pace early on and made everyone come chasing him,” said Clark, who also showed Katz Flash, a go-round leader and the last performer in the 25-horse field, to score 216 points. TGI Playtime, by One Time Pepto, drew second to work in the first set. “There were a lot of really good horses and several great horses that could definitely step up and win on any given day,” said Queen. “So it was pretty nerve-wracking to to sit through 23 more horses. TGI Playtime tied four other horses, including Katz Flash, with 218 points, the third-highest score in the Semi-Finals. Queen also showed Dirt In Da Skirt, owned by Carroll’s Cutting, to earn the seventh-highest cumulative go-round score (434.5), but was eliminated by a cow in the Semi-Finals. This was Queen’s fourth NCHA Super Stakes win. His first two wins, in 2006 and 2007, were as a non-pro on Sister CD, who was a 4-year-old in 2006. In 2008, Queen initiated his open career with a win in the Super Stakes Classic, once again riding Sister CD, an all-time leading money earner of $833,214 under his trainer, Paul Hansma, and Skip and his wife, Elizabeth. Bred by Carroll’s Cutting and trained by Queen, 5-year-old TGI Playtime was open champion at the 2013 The Non-Pro and reserve champion of the 2013 Abilene Spectacular. She also captured reserve titles this year in the NCHA Eastern Nationals and the Augusta Champions Challenge. 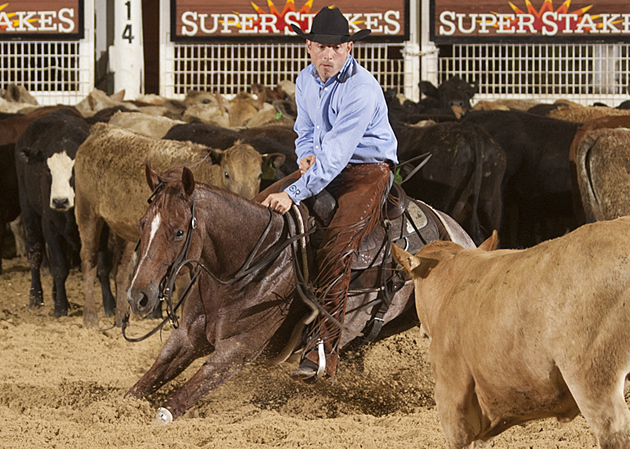 Skip and Elizabeth Queen, who live in Allendale, S.C. and maintain a cutting facility in Weatherford, Tex,, are both members of the NCHA Non-Pro Hall of Fame. Finals in the Open Division.